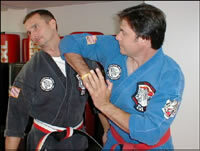 White Tiger Kempo is a complete combat martial art developed by Master Tom Bryan utilizing the optimum fighting techniques from traditional Karate, American Kenpo, Jeet Kune Do, Gung-Fu, Tae Kwon Do, Ju-Jitsu, and weaponry. Master Tom Bryan takes Bruce Lee’s concepts and principles one step further. 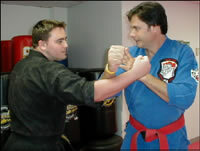 This modern day martial art was developed for our ever changing modern society. We as individuals continue to evolve just as society. Practitioners of the White Tiger Kempo system learn to be proficient from all aspects of combat to include kicking, punching, trapping and grappling. 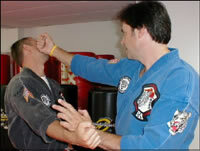 This system utilizes an array of powerful kicks, swift and debilitating hand techniques, chokes, throws, sweeps, numerous takedowns and devastating joint locks. 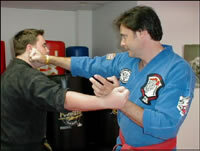 “KEMPO” meaning “Fist Principle,” adheres to the continuous motion theory in that your opponent or opponents will be overwhelmed by continuous flowing strikes and finishing techniques. The term “WHITE TIGER” is also given to this combat martial art to differentiate it from other Kempo systems. The White Tiger symbolizes ferocity, power, swiftness, and is rare. The White Tiger Kempo system utilizes weaponry to include single and double stick fighting, knife fighting and staff self-defense. Also incorporated are many empty handed weapons defenses against knives, sticks, and guns. 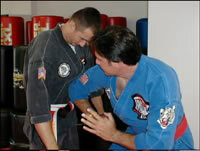 The White Tiger Kempo system is considered by many to be the best of the best!